With the new Focus, Ford has become the first non-premium automaker to win two Euro NCAP Advanced rewards. 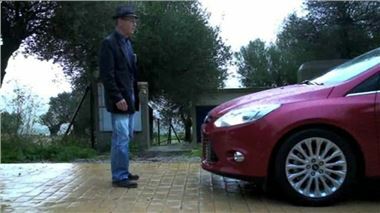 The Ford Focus was recognised for Active City Stop, which monitors the road ahead and brakes automatically if a collision is imminent, and Lane Keeping Aid, which uses a forward camera to detect if a vehicle drifts out of its lane and applies a small amount of steering input to alert the driver. The Focus has earned Euro NCAP’s maximum five-star crash safety rating, including the highest possible dynamic score for child protection in both frontal and side impact collision tests. Focus also excelled in the adult and pedestrian safety categories. The final scores were: 92% Adult Protection, 82% Child Protection, 72% Pedestrian Protection and 71% Safety Assist, total average 79%. Active City Stop helps reduce the risk of low speed collisions by monitoring the road in front for stationary traffic and then braking automatically if the system detects a stationary vehicle or pedestrian in its path and a collision is imminent. At speeds up to 20mph, a lidar (Light Detection And Ranging) sensor positioned at the top of the windscreen scans the area up to around 7.6 metres ahead for possible obstacles. If the Focus approaches a braking, slower moving or stationary vehicle in front and it determines that a collision is likely, the brakes are pre-charged. If the driver remains inactive (no steering or braking input), the Focus applies the brakes automatically and reduces engine torque. Lane Keeping Aid uses a camera mounted at the top of the windscreen to monitor the road ahead. The images from the camera are continuously analysed to detect lane markings, typically solid or dashed white lines that delineate the edges of a lane or carriageway. Information about the position of the car relative to the lines is then used to help the driver stay within the intended lane. Lane Keeping Aid does this in two ways. As the car drifts towards the lane marking, a slight steering action is automatically applied to direct it away from the line, towards the centre of the lane. This steering action is very gentle and, in most circumstances, will not by itself keep the car in its lane. However, the steering action is enough to be sensed by the driver and to indicate that correction is required. Secondly, when Lane Keeping Aid detects that the car has drifted over a line, the steering wheel vibrates as a warning to the driver. Both Active City Stop and Lane Keeping Aid are fully automatic but can be deactivated by a switch on the indicator stalk. “At Euro NCAP, we are constantly seeing new and exciting innovation in the field of automotive safety from all manufacturers and the pace of these changes can only be good for road users across Europe,” said Michiel van Ratingen, secretary general of Euro NCAP. Euro NCAP’s five-star safety award for new Focus confirms the structural excellence of Ford’s global C-Car platform. Ford C-MAX and Grand C-MAX share the same architecture as new Focus and were both awarded five stars by Euro NCAP last year. New Ford Focus is engineered to meet or exceed safety standards around the world and has been crash-tested more than 12,000 times in real and virtual worlds to guarantee the best possible protection for occupants of various ages and sizes. Fifty-five per cent of the body shell is made of high-strength steels, of which 31 per cent is ultra-tough boron steel, more than any other Ford built to date. Boron features in the A pillars, B pillars, rocker panels and door reinforcement beams to create an extremely rigid, crush-resistant passenger cell. Meanwhile, high-strength steel is used in the integrated door opening reinforcement rings and door load paths to provide excellent protection from side impacts. New Focus also features a patented front chassis subframe, which de-couples during severe frontal impacts, avoiding deformation in the passenger cell footwell area. Pedestrian protection has been boosted by the addition of a “soft” cowl design in the front body structure and Ford has also relocated the windscreen wiper system to help further reduce injury risks. New Focus is equipped with Ford’s Intelligent Protection System restraint system that includes next-generation front airbags for the driver and front passenger, as well as unique side airbags for all, complete with shoulder vents that stay open and reduce pressure for smaller occupants. A 'horizontal stroking' steering column reduces loads on head and chest as it collapses and retracts away from the driver in high speed frontal impacts. Both front seats are fitted with more effective retractor pretensioners, along with belt load limiters. Rear seat passengers are protected by three-point safety belts and all models have provision for ISOFIX as standard. Another plus is Ford’s Child Lock function, which allows the driver to electronically activate or release the rear-door child locks via a simple control switch. The locks are automatically disengaged in the event of an accident.